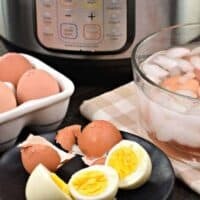 The simple 5-5-5 method for making perfect Instant Pot Hard Boiled Eggs. You’ll be amazed at how easily they peel, and how creamy and delicious they taste! I have finally found the secret to making perfect hard boiled eggs. I’m only 44 years old, so I’m counting this as a win in my book! I have many years ahead of me now making stress-free hard boiled eggs. Am I the only one who struggles removing the peel? I’ve tried all the tricks, from old eggs, to ice baths, to putting them in the oven (it’s a thing). Sometimes I’d get a couple in the batch that peel amazing, and then there are some where I remove half the white part just to get the shell off. Our deviled eggs never look pretty, hehe! Until now that is. Now that I have discovered how to make Instant Pot Hard Boiled Eggs. I recently bought myself an Instant Pot (have you heard of this???) and was afraid to use it. No really, I was overwhelmed by all it’s buttons and directions. 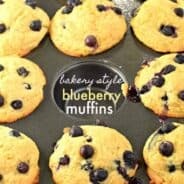 I love using my Slow Cooker, so I didn’t think I had a need in my life for another appliance. Especially a pressure cooker! But, I had heard good things about hard boiled eggs, and with Easter coming soon, I needed a solution. So, I gave it a whirl. I use the 5-5-5 method. It is not quicker than my traditional recipe, however, the ease at which the egg comes out of the shell is amazing. I’m not even exaggerating, LOL. Not only are they easier to peel than the traditional method, but I swear they taste better too! You can watch my video below to see how easy they are to make! Deviled eggs. Now that I have an easy way of making hard boiled eggs that look GOOD outside of their shell, I’ll be sharing my family’s favorite deviled eggs recipe soon! Caesar Salad and Dressing. Did you know you can make Caesar dressing from hard boiled eggs? Yep, it’s true! 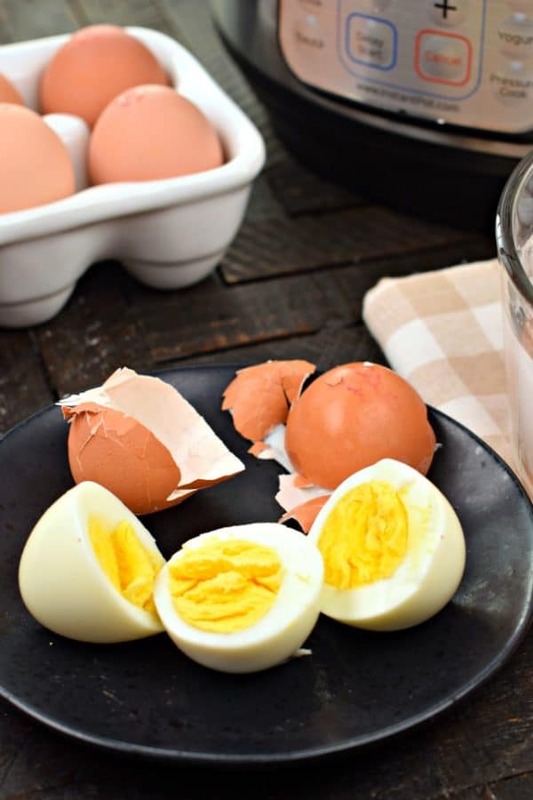 As I try to eat more protein and count my macros, I incorporate simple hard boiled eggs for breakfast, lunch, and snacks. I also slice them up and put them on salads and sandwiches too! Let’s not forget egg salad. My absolute favorite sandwich from childhood! 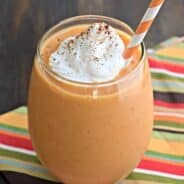 Hard boiled eggs will keep in the refrigerator for one week (not peeled), so this is the perfect thing to make on a Sunday for your week of meals! If you still haven’t gotten yourself an Instant Pot, hop on over to Amazon and snag one! I have the 6 qt and it’s plenty big for my family. I also LOVE this cookbook from Barbara, it’s packed with recipes my family LOVES. 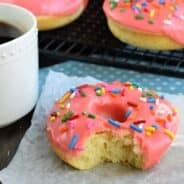 All simple, classic meal ideas, with easy to follow instructions! I’ll be sharing more recipes for the Instant Pot soon, as I’m learning how quick, easy, healthy meals can be made using a pressure cooker! You can also head over to my INSTAGRAM…I’ve teamed up with a few friends to give one away to a lucky person! Be sure to enter to win! 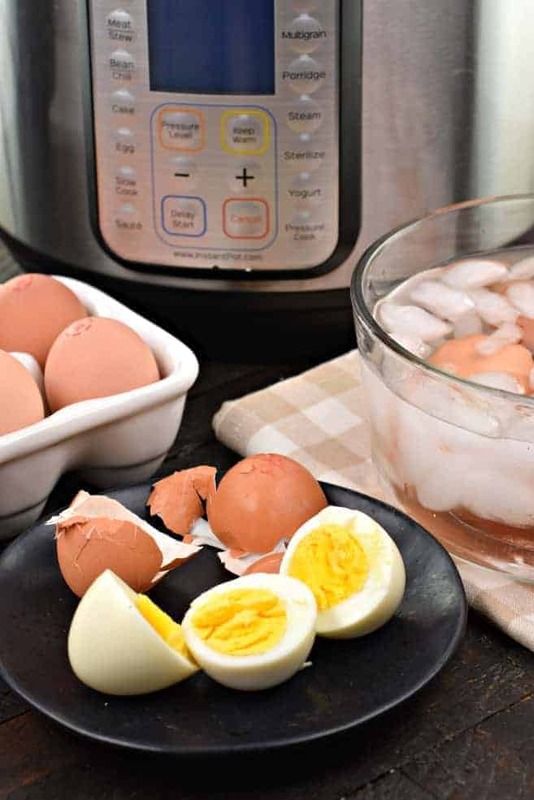 The simple 5-5-5 method for making perfect Instant Pot Hard Boiled Eggs. You'll be amazed at how easily they peel, and how creamy and delicious they taste! Place the rack that came with your instant pot in the bottom of the pot. Pour in your cold water. Add your eggs (it's okay if they're touching). Close the lid and set the pressure to high for 5 minutes. It will take several minutes for the pressure to build. Once the timer goes off (after cooking for 5 minutes), allow the pressure to naturally release for 5 minutes (set a timer). While this is happening, fill a big bowl with ice water. Once your timer goes off, quick release the pressure and open the lid. 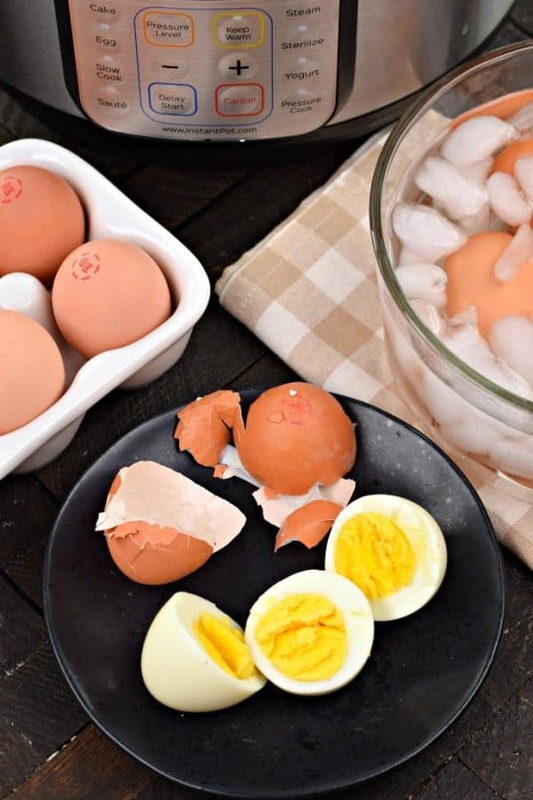 Remove the eggs and place them in the ice bath for 5 minutes. You can now peel and use, or refrigerate for up to one week (unpeeled). ENJOY!